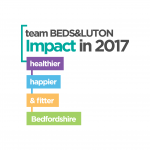 Grants for young people in Leighton Linslade! Ladies! Do you want to be part of something special and become an activator, leader and/or coach? General Data Protection Regulations (GDPR) is changing, and this will impact on the data we store as well as the data some clubs might store too. Join our Team! Board Members Needed! Walking Netball Launched in Bedfordshire! Find out more..
CLICK HERE to see some of the impact we have made this year.